1. Quick release VESA function. 2. Moves the monitor to the desired position. 4. Meets current ergonomic guidelines. 5. Quick and simple installation. 1. Weight capacity: 4~9 kg (8.8~19.8 lbs). 2. 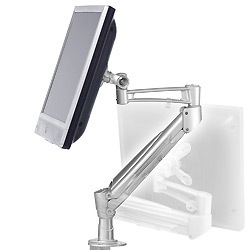 Tilt: 35° up and 25° down (display) & 45° up and 20° down (arm). 3. Rotation: 180° for portrait or landscape viewing (right & left). 4. Material: high quality aluminum alloy. 5. Mounting option: extended model (clamp type). 6. Pivot: 360°, 360°, 360° (desk, arm, display).